Size of Fitting =: 1.5" 2" 3"
Generally resistant to most acids, bases, salts, aliphatic solutions, oxidants, and halogens; the fittings exhibit excellent physical properties and flammability characteristics. 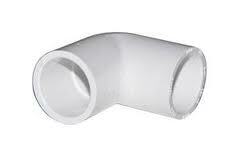 The smooth interior surfaces of PVC Schedule 40 fittings assure low friction loss and high flow rate. Because the PVC pipe and fittings do not rust, pit, scale, or corrode, the high flow rate continues for the life of the piping system. Typical uses include irrigation, potable water systems, water and wastewater treatment, drainage, agricultural, and other applications involving corrosive fluid transfer. Whether you are installing a new irrigation system or only making a repair, knowing how to install the PVC fittings and pipe can be a useful skill that can make your irrigation system last. Please read below our recommendations for a good installation or repair. Before you begin the process of installing a new irrigation system or start a repair, please be aware of the correct steps needed, and that inspection is needed on completion. After inspecting the system and finding the cause of the problem, you will be in the position to know the equipment needed for the repair. If you are unable to obtain the PVC fittings in the correct size, you may need to use some combination of fittings to satisfy your need. Once you have all the required measurements, cut the PVC pipe in accordance with your notes. Stretch the tape measure along the pipe to the required length and mark the distance to be cut with a pencil line. Secure the fittings to prevent them from slipping while they are being cut. Ensure that your efforts were correct by drying the fitting and pipe and then testing that they slot into place as they should and are properly aligned. When the fittings are firmly in place and secure, trace a pencil line along the edge of the fittings so that you can return them to the correct position when you glue them. Once this is complete, you can disassemble the pipe and fittings. Make sure that the fittings and pipe are clean. 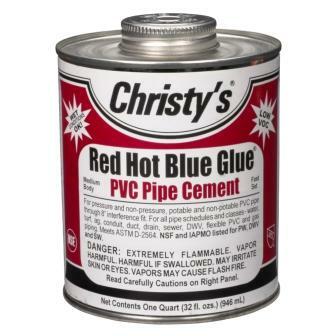 Open the Red and Blue PVC glue and using the brush swab the glue around the outside edges of the pipes and inside the side of the fitting you are gluing. Make sure to limit this action to the portions that will be fitted together, Insert the pipe into the fitting and allow it to dry for a few seconds. When all the parts are correctly in place, quickly use a rag to wipe away any excess glue that remains on the outside of the pipes before it dries. After completing the job refrain from turning on the system for a few hours. After few hours pass, you may cover some of the pipe but leave all the connections exposed. Turn the system on and review to make sure that no leaks are found. At this point you can cover the rest of the pipe.